An academic analysis of the greatest catalogue of the modern pop-era. Pressure Group. Grassroots activists. Almost 7 years after Michael Jackson’s manslaughter, the Michael Jackson Estate has finally cut the deal that Jackson’s friends and family claim he believed he would be killed for; Sony Music has taken ownership of Jackson’s 50% share of the Sony/ATV music-publishing catalogue it had jointly owned with him since 1995. News of the deal broke on March 15th, 2016. Jackson’s former lawyer, John Branca, now executor of the Michael Jackson Estate and, coincidentally, also an advisor to Sony Music, oversaw the sale. 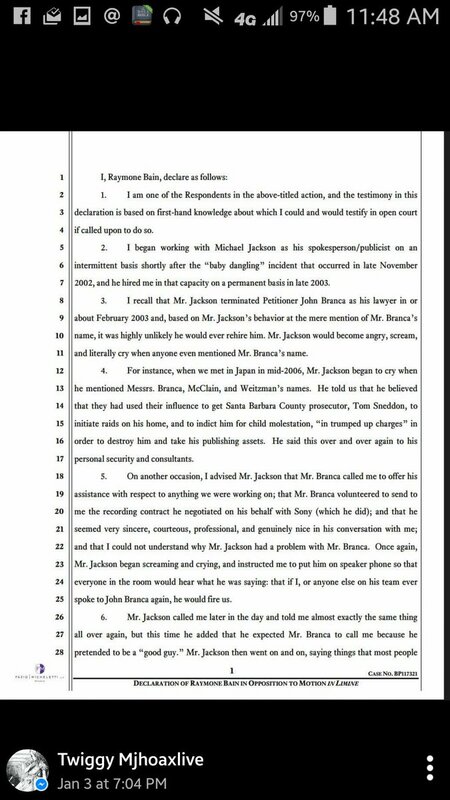 Public court records show several of Jackson’s friends and relatives (Jackson’s former spokesperson, Raymone Bain, Jackson’s father Joseph, Jackson’s brother Randy) have stated under oath that Jackson, for several years prior to his death, had suspected John Branca of working against his best interests. Testimony in Jackson’s 2005 criminal trial revealed private investigative firm, Interfor International, had been hired to investigate John Branca’s conduct and alleged conflict of interest. Lawyer David LeGrand testified in open court that Interfor’s report revealed, among other findings, a bank account located in the Caribbean which both Branca and former head of Sony Music Tommy Mottola – who Jackson had publicly accused of sabotaging his career in 2002 – had access to. According to those closest to him, Jackson repeatedly alleged that forces were conspiring against him in order to obtain his 50% share of Sony/ATV. Jackson frequently spoke of a ‘conspiracy’ against him. One such claim was made during his 2005 trial, in a radio interview with Reverend Jesse Jackson, in which he spoke about his concerns over his stake in Sony/ATV. Jackson’s relationship with Sony deteriorated so badly that after his death, his 2005 trial lawyer Thomas Mesereau revealed that while he never saw any evidence to support the claim, Jackson had told him during the trial that he fully believed Sony Music was somehow involved in his prosecution. In 2002, Jackson staged anti-Sony demonstrations in London and New York. Several of the New York events, where pictures seem to show Jackson wearing a bulletproof vest, were attended by his friend Reverend Al Sharpton, who has since publicly claimed Jackson told him that he believed people were after his catalogue. (Side note: Sharpton has also publicly claimed he was with Jackson in New York from Friday, 5th July 2002, until 9th of July 2002). After Jackson’s manslaughter, Branca took control of his Estate using a Will naming him and John McClain as executors. That Will was purportedly signed on July 7th, 2002 in Los Angeles. It has since been claimed by Jackson’s relatives that Jackson was in New York at the time, protesting against Sony. Reverend Al Sharpton has publicly claimed he was with Jackson in New York on the date the Will was supposedly signed in Los Angeles. Photographs and videos show Jackson in New York on the days either side of the supposed Will-signing. After Branca assumed control of the Jackson Estate, some long-time fans voiced concerns online that that he would sell Jackson’s share in Sony/ATV back to Sony Music. However, Branca publicly stated that the publishing catalogue was a ‘cornerstone asset’ that the Estate would hold onto for Jackson’s ‘children and family’. In early 2014, news broke that the IRS believed the Jackson Estate had ‘grossly misled’ them with its valuation of the Estate for tax purposes. The Estate had seemingly claimed in a tax return that Jackson’s 50% of stake in Sony/ATV – which includes the famed Beatles catalogue, and which it sold this week for $733,000,000 – was worth $0.00. The sum total demanded by the IRS in back taxes and penalties was just shy of three quarters of a billon dollars, $731,000,000. A court case is now due to start in early 2017. Some long-time Jackson fans wrote online that they believed the court case would be the moment the Estate would try to sell Jackson’s treasured catalogue to Sony Music. In October 2015, it was reported that Sony Music had triggered a clause in its contract with Jackson, which allowed one of the owners to buy the other half’s shares. The news was seen by many long-time fans as signalling the beginning of the inevitable, even though the original spin on the story suggested the Estate would buy Sony Music’s share, not the other way around. In March 2016, the ‘inevitable’ was finally confirmed; Sony Music had purchased Jackson’s share of Sony/ATV for $733,000,000 – almost the exact figure of the debt the Estate allegedly contrived to owe the IRS. Distraught fans took to social media to vent their disgust. Uncharacteristically, multiple members of the Jackson family took to social media to condemn the move. Jackson’s nephew, Randy Jackson, Jnr, tweeted his feelings and was retweeted by multiple members of his family. Jackson’s own daughter, Paris Jackson, had publicly expressed her feelings towards Sony Music in the week leading up to the sale on her Instagram accounts. In an effort to placate fans, the Estate eventually penned a letter, which did nothing to abate the ill-feeling. Promises of holding on to whatever assets now remain ring hollow. What Jackson’s children now own can no longer be guaranteed.